I love a Chinese breakfast, and I rarely get to eat one thanks to the cereal-and-toast lovers I live with. Occasionally, when travelling, I luck out and we stay in someplace with no western food whatsoever. How very delicious. 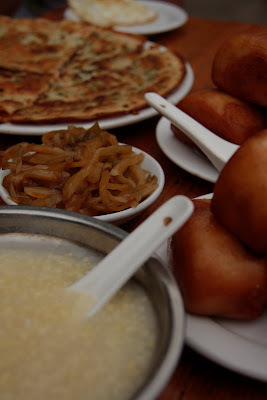 Millet congee with pickles, fried bread, and cong you bing, a kind of savoury fried pancake. This breakfast also came with sweet corn, grown on the terrace just below us, and a big pot of smoky dark Longji cha, the local tea. They actually ate it too, initially out of desperation born of starvation, then out of surprise, then out of enjoyment. Fiona, 1. Cereal-and-toast lovers, nil.